Fresh wolf tracks found along the side of a forest road. Last week we had our first wildlife photography workshop and wolf habitat expedition. Twenty-one people showed-up for the photography workshop led by renowned Idaho photographer, Larry Thorngren. Larry set up a small art gallery in the classroom where the workshop was being held, so people arriving early could take a look at some of the fabulous photos of the wildlife in the northern Rockies and Canada. People brought in their own cameras so they could ask questions about the best settings, accessories, and lenses to use, and Larry answered everything they wanted to know. He also went through the basics of camera theory and practice, before moving onto more practical lessons such as the best place to set up photography blind and the ethics of photographing wild animals. He interlaced all this information with tales of face-offs with bears, shooting (with a camera) some of the world’s biggest bighorn sheep, and how he sold his house to buy more camera equipment. At the end of the workshop many people staying behind to ask more detailed questions about photography and about Larry’s work. 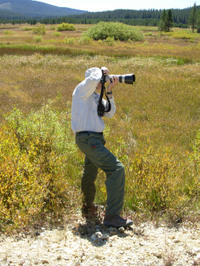 One of the wolf tour participants taking photos in Idaho's wolf country. The second part of the workshop was a one day expedition to wolf country. We all met up at a Forest Service Road in a central Idaho location early Saturday morning. This area near the Frank Church Wilderness is equivalent to Yellowstone’s Lamar Valley, except better. Here you will find a number of wolf packs; bears, elk, sand-hill cranes, otters and pikas, and the creeks here are filled with salmon and cutthroat trout. Carter Niemeyer, former Wolf Recovery Coordinator for the US Fish and Wildlife Service, joined us for the day to explain his trapping and collaring work, and to answer any questions about wolves in general. He has been involved with wolf recovery since the reintroduction (in fact he was involved in the trapping of the original reintroduced wolves from Canada) and so knows more than most about wolves in the Northern Rockies. We spent much of the day driving around the many meadows and forests that make up this area, stopping every so often so the photographers could snap pictures of the wildlife and scenery. Larry would help out with any technical camera questions, and Carter informed the group about wolves and wolf recovery which the participants enjoyed hearing. Wolf watchers setting up their cameras and scopes at dusk. As the end of the tour approached we had still not seen a wolf, although this was not surprising as it was in the middle of the day, a time when wolves are usually bedded down someplace. On the way back to the highway, we stopped by a hunting camp to see how things were going. The elk hunters at the camp told us that they heard wolves howling the last two nights in the meadow behind their camp. Hearing this, we decided to prolong our trip and check out the meadow. It was still early for wolves, but you never know! We parked our cars, hiked up to a tree covered ridge overlooking the meadow, set up our spotting scopes and cameras, and waited. After about a half hour, an eagle-eyed member of the expedition (me) spotted a small black canine, way over on the other side of the meadow. Others swung their scopes that way and a few of us had the pleasure of seeing a wolf pup run about near the tree-line for about thirty seconds before disappearing into the woods. We waited some more before deciding to call it a day and head back home. However, a few of the participants decided to brave the cold September night and stayed out until dark, and they were rewarded with views of at least four wolf pups playing in the meadow, and they managed to take a couple of photos as well - as you can see. All in all it was a great day, and all the participants enjoyed themselves, as did all of us. We hope to show the state agencies and tourism board here in the three states of Wyoming, Montana, and Idaho, that there are a large number of people who enjoy seeing wolves, and are very happy to ‘catch and release’ them with their cameras instead of with guns. These people should have just as much say in wolf management as the hunters and outfitters do. This was in our news today! WYOMING – The gray wolf will likely return to the endangered species list in Wyoming, Idaho and Montana less than a year after it was removed by the federal government. The imminent reversal follows a decision by the U.S. Fish and Wildlife Service to reconsider its position. In March of this year, the Fish and Wildlife Service removed the Rocky Mountain Gray Wolf from the endangered species list. The delisting was based on the conclusion that the wolf reintroduction program in the region had been a success and the wolf population had reached a healthy level. Hunting of the gray wolf ensued. Several environmental groups banded together to sue the federal government claiming the hunts would eventually bring the wolf population back to crisis levels. In July, a federal judge in Montana agreed and ordered a halt to the hunts. The injunction gave the wolves in Wyoming, Idaho and Montana federal Endangered Species Act protections once again. On Sept. 22, U.S. Fish and Wildlife asked the same judge to throw out the government’s earlier decision to de-list the wolf and officially place it back on the endangered species list. All parties expect the judge to sign off on the request. Environmental groups expressed relief over the news. “We see this as a greater opportunity to gaining greater protection for the wolf,” said Duane Short, wild species program director for Laramie-based Biodiversity Conservation Alliance. The Fish and Wildlife Service said it will take the wolf issue and go back to the drawing board. Wyoming Gov. Dave Freudenthal, who doesn’t think the gray wolf should return to the endangered species list, is encouraging the Fish and Wildlife Service to again favor de-listing and state-controlled hunting.